Adolph Rosetter #54 and Ken Macy #199 stand with a 1951 Ford. Photo courtesy of the Rosetter family. This photo, provided by R.C. 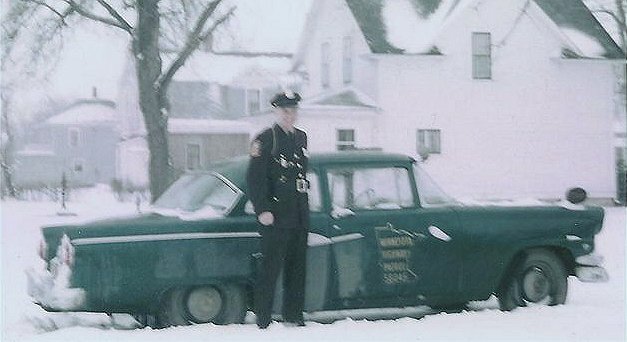 Logan, was taken in Benson, MN, in 1954, where several Highway Patrol cars were on public display at a city park. The 1952 Ford Mainline ran a 255 CID flathead V8 and a 3-speed manual transmission. The 1953 Police Package included a 255 CID flathead Mercury V8 engine. Equipped with dual exhaust, it produced 125 hp @ 3700 rpm with a torque rating of 218 lb-ft @ 1700 rpm. This was the first year of the overhead valve V-8 engines for Ford and the first year Ford marketed it as the Interceptor. The MHP's Interceptors included an optional 256 CID Y-block V-8 borrowed from Mercury. Equipped with a 4-barrel carburetor and dual exhaust, the all new engine was rated at 161 hp @ 4400 rpm and produced 238 lb-ft of torque @ 2200 rpm. Other special equipment in the police package included optional 7-leaf rear springs, heavy duty brakes, 7.10 x 15 tires, and a laundry list of other severe service features. Pictured with the 1954 Ford here are Joel Brown and Gerald Kittridge. Several of the ’55s were white. Administrators decided white probably wasn’t the best color for a patrol car considering Minnesota winters. So, the hood, roof and decklid were repainted dark blue to achieve this unique two-tone treatment. The 1955 Fords were equipped for duty with a 292 CID Mercury V-8 with 7.6:1 compression producing 188 horsepower at 4400 rpm and 272 ft-lb of torque at 2500 rpm. 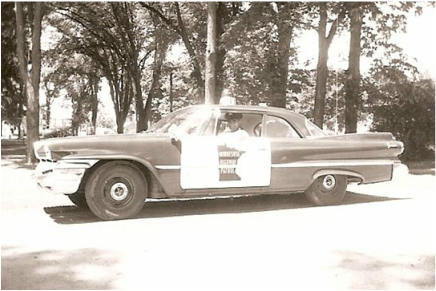 For the 1955 model year, Chevrolet introduced their first police pursuit vehicles. 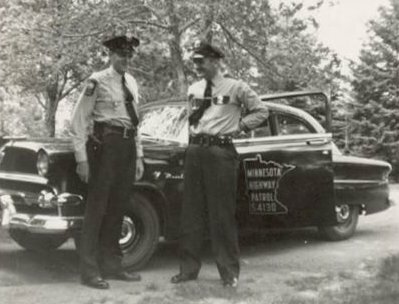 The Minnesota Highway Patrol purchased only about a dozen of the $1784 base-priced Chevrolets, perhaps to determine if the Chevys cut the muster. At least one was assigned to each patrol district. 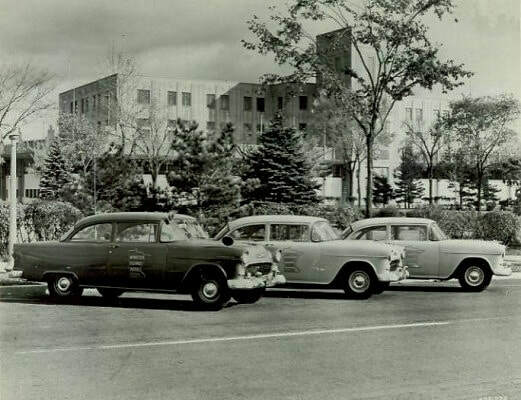 Each of the two-door sedans was equipped with Chevrolet's all new 265 CID V8 with 4-barrel carburetor, dual exhaust, and 3-speed manual transmission. The Chevys had a 50/50 front/rear weight ratio. This enabled one to drift them around curves at higher speeds than the nose heavy Fords of the day, making for a more pleasurable driving experience for those who were skilled enough to appreciate it. The Chevys were ordered in a variety of colors. 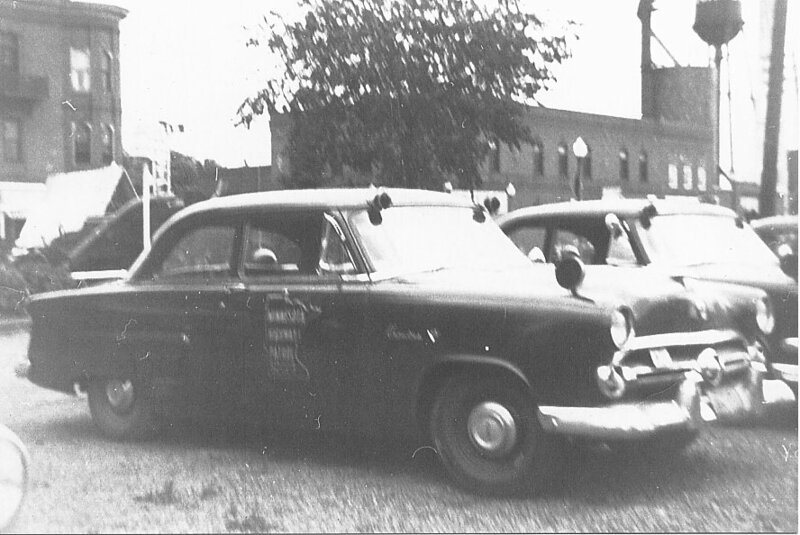 Many were specially marked units that displayed door graphics, but no roof or front fender lights, like the two light-colored cars in the photo. They used only a red bulb in the single driver side spotlight. 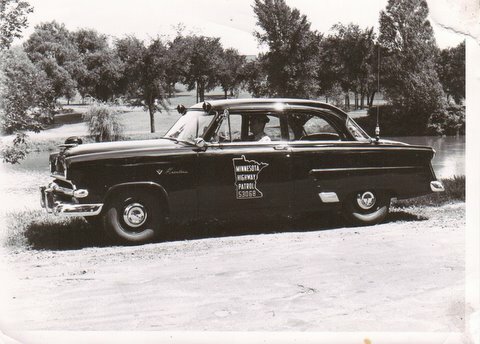 The Highway Patrol purchased 1956 Fords outfitted with the new 312 CID Y-block V-8. The 312 used a single 4-barrel carburetor and would reach a top speed of nearly 120 mph. In the photo at right, Don Keepers is pictured with this Pine Ridge Green example. Roger Keepers, brother of Patrolman Don Keepers, is kneeling beside this brand new '58... I don't know if Roger was praying for the car or for the poor souls who were about to become its victims. 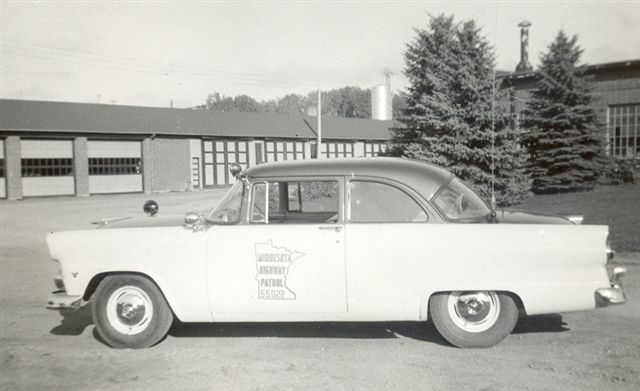 At the urging of AAA and other groups, Maroon (Ditzler paint code 50551) was adopted as the standard color for the Minnesota Highway Patrol in 1958. This was also the first year of the roof-mounted “gumball”, which was surrounded by a large gold star decal. The 1958 Fords were powered by a 352 CID V8 with automatic transmission and 2.69:1 rear axle. For this year only, the Pursuit Special, based on the Savoy model, was equipped with a 295 horsepower 350 CID "Golden Commando" wedge V-8. The 280 ft-lb of torque were relayed to the 3.31:1 rear axle through a 3-speed TorqueFlite automatic transmission with pushbutton shifter. The 1959 Ford Custom was equipped with a 352 CID V-8 with hydraulic lifters. Power was relayed to the 3.73:1 rear axle by means of a 3-speed manual transmission. Shod in 7.10 x 15 tires, these were terrible handling machines, particularly in any sort of crosswind or wet road conditions. They were truly disappointing automobiles in comparison to Ford's previous offerings in the market. Pictured with the Ford is Bert Johnson. 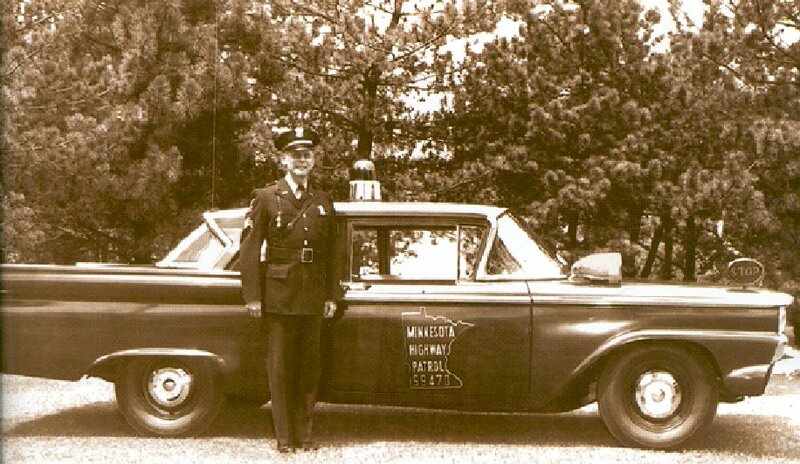 The Highway Patrol also used Plymouths in 1959. Based again on the Savoy model, the 1959 Plymouth Pursuit Special used the “Golden Commando” 361 CID V8, coupled to a pushbutton operated TorqueFlite automatic transmission and 3.31 rear end. They used 7.10 x 15 tires. The new engine was rated at 305 hp and 395 lb-ft torque. They were exceptional handling cars for their day and had super acceleration and would reach a top speed of about 120 mph. 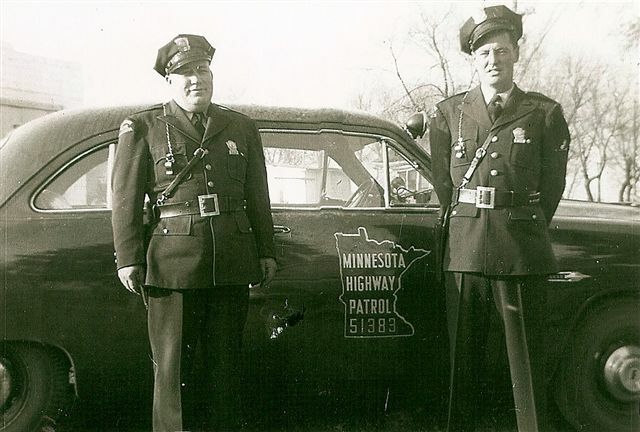 The Highway Patrol used several makes of cars again in 1960. This Dodge Dart Seneca was probably the rarest of them all. It rode on a 118” wheelbase, was powered by the 305 hp 361 CID V-8, and used the TorqueFlite automatic transmission to send power to the 3.31:1 rear axle. Photo courtesy of J. Dickson. Virg Karl is seated in a 1960 Ford as he chats with Jerry Kittridge. The Ford was equipped with a 352 V8, 3.10 rear axle, and an automatic transmission. This transmission was "a real slush-bucket" in comparison to Chrysler's TorqueFlite, according to one retired trooper. These units had a top speed of about 110 mph. Detroit insiders were certain Chrysler and GM were going to release new sleek designs for 1960. So, although it wasn't fully engineered, Ford rushed the new body style into production and dropped it on the 1959 chassis. The result was a terribly clumsy combination that handled and performed poorly. The 1960 Plymouth Pursuit Special was again equipped with the 361 CID V8 and automatic transmission. Plymouth advertised the Minnesota Highway Patrol as one of several major agencies using their cars this year.